Sturdy, yet airy, rustic, yet delicate – these bracelets will be noticed wherever you go. After a lot of thinking and experimenting, I finally came up with this new technique that I am happy to share with you. The tutorial contains more than 30 pages with detailed step-by-step instructions illustrated by over 90 full-color pictures. Following this tutorial, you will learn how to make every one of the six bracelets shown in the first two pictures of this listing. Place a mouse over the small pictures to see them enlarged. After mastering the projects explained in this tutorial, you will be able to come up with your own designs not only for more bracelets, but also for necklaces, earrings, pins, and more. 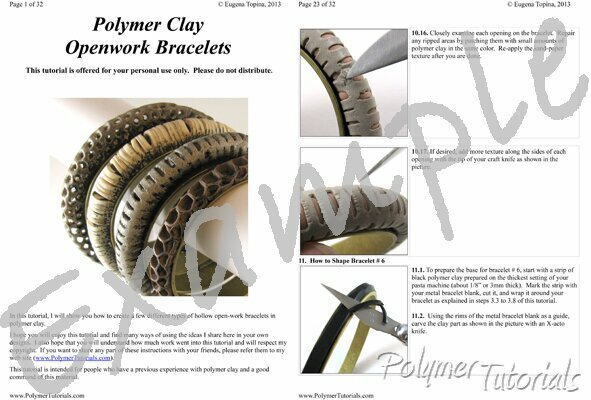 This is a new revision of the original Openwork Bracelets tutorial. In this version the step that used to require a waiting period of up to a few days is now reduced to a couple of hours.